Obama is expected to release oil from the Strategic Petroleum Reserve as Iran sanctions bite and gas prices rise. But analysts say it should be kept for a real emergency. NEW YORK (CNNMoney) -- As U.S. sanctions on Iran tighten and gas prices reach record levels, it is becoming more likely that a release of oil from the U.S. Strategic Petroleum Reserve is in the works. Yet analysts aren't convinced tapping the SPR is a good idea. Administration officials said Friday that reserves from the SPR were taken into account when they determined that oil markets could handle the loss of Iranian oil. Even before the tighter sanctions were announced, there was talk the administration was working with European countries on a plan to tap oil reserves in both the United States and Europe. The rumors have already pushed global oil prices down slightly, although they remain over $120 a barrel. Still, analysts are skeptical about what impact tapping the SPR would have on prices. They note that in the past it has been small and short lived. They also say that the reserves are intended to cover events that produce actual shortages of gasoline at U.S. service stations, like what could happen in a full-blown conflict with Iran. Reserves were not designed to bring down prices in a jittery market. "Only physical supply interruptions merit a draw," said Kevin Book, managing director of research at ClearView Energy Partners. Rising oil prices over the last couple of months are a sign that things with Iran could get really bad, and that "we shouldn't be burning our safety net in our gas tanks." The U.S. SPR consists of roughly 700 million barrels of oil stored in underground salt domes in four locations along the Gulf Coast -- two in Louisiana and two in Texas. The amount of oil in the reserve is equal to about 80 days worth of U.S. imports. Other developed nations, including some European countries, Japan and the United Kingdom, also maintain smaller strategic oil reserves. The U.S. reserves are controlled by the President, who can sell the oil or fill it at any time. 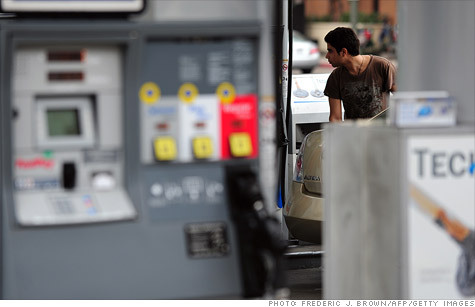 With gas prices rising and elections looming, there's been pressure on Obama to tap the reserve. Last month a coalition of Democrat lawmakers wrote the president urging him to release oil from the SPR. The oil would then be sold to refiners. Republicans generally oppose the idea, saying oil reserves should only be used for an emergency. Plus, with the President taking so much heat for rising gas prices, lower prices wouldn't help Republican chances going into the election. Seven in ten Americans said rising prices have caused hardship for them and their families, according to a recent CNN poll. Obama tapped the SPR last year in response to the civil war in Libya, which shut in some 2 million barrels a day in oil production. Before that, it was used to cover the disruption from Hurricane Katrina in 2005. Clinton also tapped it a handful of times during his tenure. It's unclear what impact more oil from the SPR would have on gasoline prices right now. While global oil prices have been soaring, U.S. oil prices are relatively lower due to a glut of oil in the Midwestern part of the country, where most of the SPR crude would likely flow to. But since U.S. gasoline prices are pegged to the cost of global crude prices, which are running $20 or so a barrel over U.S. crude, just tapping the SPR may not help at the pump. Analysts think the only way gasoline prices might be brought down -- if they are brought down at all -- is through a coordinated release of oil by the United States and other developed countries. If a release comes, the administration will likely blame a variety of oil outages worldwide. Iran is the biggest -- analysts expect up to a million barrels day could be lost if sanctions take full effect -- but there are other outages totaling maybe another half million barrels a day as well, notably from Sudan, Syria and Yemen. Still, the 1.5 million barrels in lost daily production pales in comparison to what might happen in a real emergency. The Strait of Hormuz, which Iran has repeatedly threatened to close, sees 17 million barrels a day pass through its waters. That's a fifth of global production. "Caution is still the word," Daniel Yergin, IHS CERA Chairman and author of "The Quest: Energy, Security, and the Remaking of the Modern World," told a Senate panel last week when asked about tapping the SPR. "The whole system was set up to deal with disruptions, and there are a lot of uncertainties ahead."